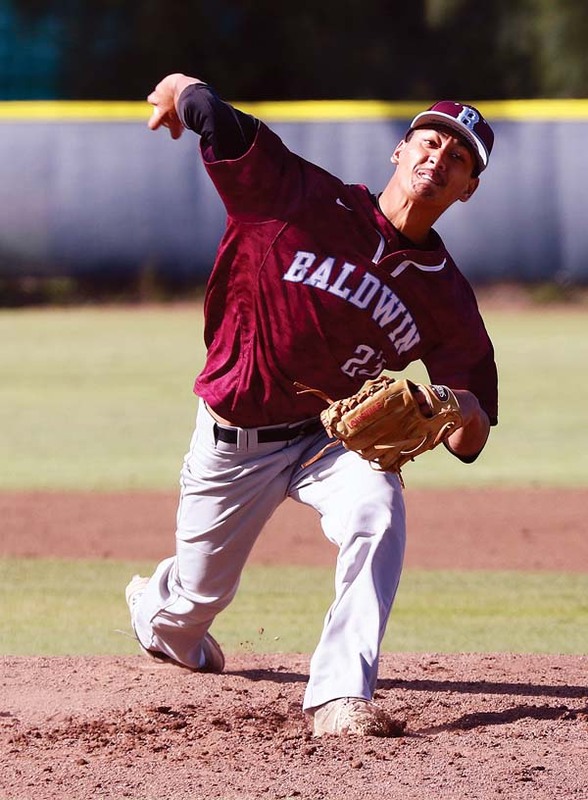 WAILUKU — Anthony Hoopii-Tuionetoa has been on big baseball stages: starting as a sophomore for Baldwin High School’s 2016 state championship team, and back-to-back trips to trips to the Senior League World Series come to mind. The Bears senior addressed by almost all who know him as “Bubba” has never experienced anything quite like he did on Friday afternoon when he took the mound at Maehara Stadium to face Maryknoll in the Maui High School Invitational. Scouts from the Atlanta Braves and Boston Red Sox were in the house to watch his first start on the mound as a varsity player. Hoopii-Tuionetoa is rapidly drawing attention from the professional baseball world as his fastball has reached speeds of 92-94 mph. Hoopii-Tuionetoa lasted four innings, throwing 71 pitches in a no-decision in the game that ended in a 4-4 tie due to the two-hour time limit put in place for the tournament. He allowed four runs, five hits, struck out three and walked three. Baldwin coach Shane Dudoit said that knowing scouts were in the stands with radar guns had to weigh on Hoopii-Tuionetoa’s mind. The only real trouble spot for Hoopii-Tuionetoa came in a three-run second inning. He struck out Justice Yamashita on a nasty curveball and got a groundout from Hailama Swartman to start the inning, but then he hit a batter, gave up an RBI double and walked two straight to load the bases. A high bouncer back to the mound by Maddux Miyasato glanced off of Hoopii-Tuionetoa’s glove, keeping the inning alive and scoring a run. He walked in a run before getting out of the frame by inducing a pop fly. That composure was impressive, according to Maryknoll coach Eric Kadooka, who coached Punahou to seven straight state titles from 2004 to 2010. Hoopii-Tuionetoa said that he will consider four-year schools, junior college and the Major League Baseball draft in June. “Keeping my options open,” he said. Both Dan Cox, the Braves’ area scout for Hawaii, and L.C. Smith of the Red Sox talked to Hoopii-Tuionetoa on Thursday and Friday. Hoopii-Tuionetoa smiled when asked about the chance to be seen he helped bring for other players on the field.